The mannan-binding proteins (L-MBP and S-MBP, also denoted MBL-C and MBL-A), mainly produced in liver and existing in liver and serum, play important roles in the innate immunity against a variety of pathogens. Total RNA from mouse tissues were screened for MBP mRNA by RT-PCR. In addition to liver, S-MBP mRNA was detected in lung, kidney, and testis, and L-MBP mRNA was detected in kidney, thymus, and small intestine. Quantitative RT-PCR revealed that the small intestine is a predominant site of extrahepatic expression of L-MBP. Western blotting with polyclonal Abs against rat L-MBP demonstrated this protein in Triton X-100 extracts of the small intestine obtained from mice that had undergone systemic perfusion. Immunohistochemical staining with an mAb against mouse L-MBP and in situ hybridization revealed that L-MBP is selectively expressed in some villous epithelial cells of the small intestine. These findings suggest that L-MBP plays a role in mucosal innate immunity. Mannan-binding protein (MBP),4 also called mannose-binding protein or mannan-binding lectin (MBL), is a Ca2+-dependent (C-type) animal lectin (1, 2, 3, 4). MBP was first isolated from rabbit liver and then from rabbit serum and was originally designated liver-type MBP (L-MBP) and serum-type MBP (S-MBP) (1, 2). The terms MBP-C and MBP-A, respectively, were later introduced (3), and now the terms MBL-C and MBL-A are gaining popularity in the immunology field. MBP is a member of the collectin family, in which the carbohydrate recognition domains are attached to collagen-like regions, forming oligomers with various degrees of oligomerization through disulfide bonds. MBP preferentially binds to carbohydrates terminated with mannose, N-acetylglucosamine, or fucose, recognizing two common equatorial hydroxyl groups (5). Extensive expression of these carbohydrates on the cell surface has been found in various microorganisms and on some human tumor cell lines (6, 7). S-MBP bound to carbohydrate ligands has been shown to trigger complement activation (8), in which MBP-associated serine proteases (9, 10) as well as C1r and C1s (11, 12) mediate the activation of C2 and C4. Under physiological conditions, however, S-MBP seems to be associated only with MBP-associated serine proteases (13). MBP has also been reported to directly opsonize microorganisms for phagocytes, through proposed collectin or Clq receptors (14). Moreover, MBP was recently shown to exhibit anti-tumor activity toward a human colorectal tumor cell line with an abundance of MBP ligands on its cell surface, apparently through a mechanism designated MBP-dependent cell-mediated cytotoxicity (7). Thus, it is well established that MBP plays a critical role in innate immunity, recognizing certain carbohydrate structures on the surface of undesirable cells or pathogen-associated molecular patterns (15). In humans, low serum levels of MBP, which are caused by promoter polymorphisms and three types of mutations in the collagen-like region, are linked to a common opsonic defect that predisposes individuals to recurrent infections (16, 17). Interestingly, while two forms of MBP are present in rodents and other animals, in humans only one functional MBP gene exists. It is well known that both forms of MBP are mainly synthesized by hepatocytes and have been isolated from liver or serum. However, we previously reported that S-MBP is also synthesized in rat kidneys, suggesting that MBP may play a role in regional host defense (18). This finding has led to more comprehensive exploration of extrahepatic expression of MBP. In this study we have investigated the expression of MBP in various tissues of normal mice, and we found that the small intestine is a predominant site of extrahepatic expression of MBP. C57BL6/J mice were purchased from Nippon Clea (Tokyo, Japan) and housed under specific pathogen-free conditions. The mice were used at 5–6 wk of age. All experimental procedures were conducted according to the guidelines of our institutional animal care committee. Total RNA was extracted from various tissues of C57BL6/J mice using a RNeasy kit (Qiagen, Hilden, Germany), following the manufacturer’s instructions. The RNA content was determined spectrophotometrically. Subsequent to denaturation at 65°C for 5 min and quenching on ice, 10–20 μg total RNA was reverse transcribed in a total volume of 20 μl first strand buffer (Life Technologies, Grand Island, NY) including 5 mM DTT, 0.5 mM of each dNTP, 1 nmol of random hexamer (Takara Biomedicals, Tokyo, Japan), 25 U of ribonuclease inhibitor (Wako Pure Chemicals, Osaka, Japan), and 200 U of Superscript II reverse transcriptase (Life Technologies) at 37°C for 1 h.
The resulting cDNA, corresponding to 100 ng of total RNA, was subjected to PCR amplification in a total volume of 25 μl AmpliTaq buffer (PE Applied Biosystems, Foster City, CA) including 0.2 μM of each primer, 0.32 mM of each dNTP, and 2.5 U of AmpliTaq Gold DNA polymerase (PE Applied Biosystems). The primers used for amplification of the S-MBP sequence were 5′-GGGAAATTGGGGCCTCCAGG-3′ (S-MBP sense) and 5′-CAGTCTTCCCCAGAGCCATG-3′ (S-MBP antisense), which amplified a 452-bp fragment corresponding to nt 307–758 (3). The primers used for amplification of the L-MBP sequence were 5′-GCAGTTCTCCAGGCCTGAAT-3′ (L-MBP sense) and 5′-CAGTCTTCCCCAGAGCCATG-3′ (L-MBP antisense), which amplified a 262-bp fragment corresponding to nt 303–564 (3). β-Actin was used as a control. The primers used for amplification of the β-actin sequence were 5′-AAGAGCTATGAGCTGCCTGA-3′ (β-actin sense) and 5′-CAGGAGGAGCAATGATCTTG-3′ (β-actin antisense), which amplified a 270-bp fragment corresponding to nt 811-1080 (19). Oligonucleotide primers were purchased from Genset (Kyoto, Japan). The PCR conditions used for amplification of the S-MBP cDNA were as follows: 98°C for 4 min, followed by 35 cycles of 98°C for 30 s (denaturation), 64°C for 1 min (annealing), and 72°C for 1 min (extension), with 3-min incubation at 72°C at the end. The conditions used for L-MBP and β-actin were the same as those used for S-MBP, except that the annealing temperatures were 59 and 60°C, respectively. 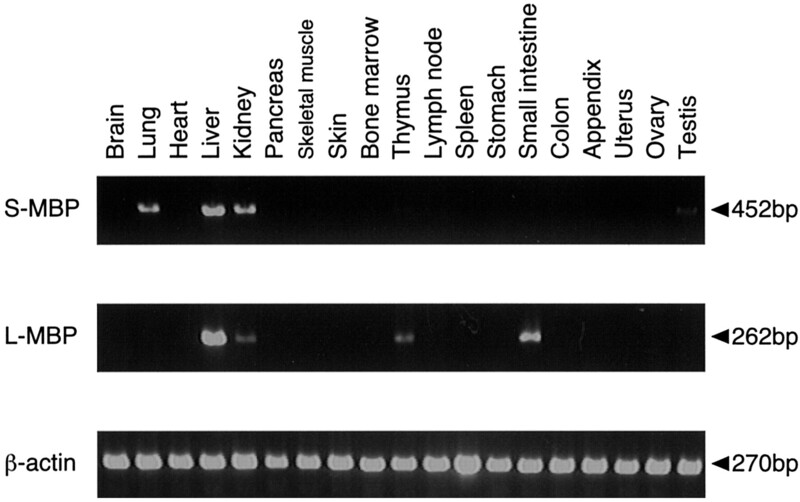 The PCR products were run on 2% agarose gels and visualized by staining with ethidium bromide. For samples positive for S-MBP or L-MBP, PCR was performed again on a larger scale, and the products were purified with a nucleotide purification kit (PCR-Quick; Qiagen, Chatsworth, CA), followed by digestion with SphI or BcnI, respectively. 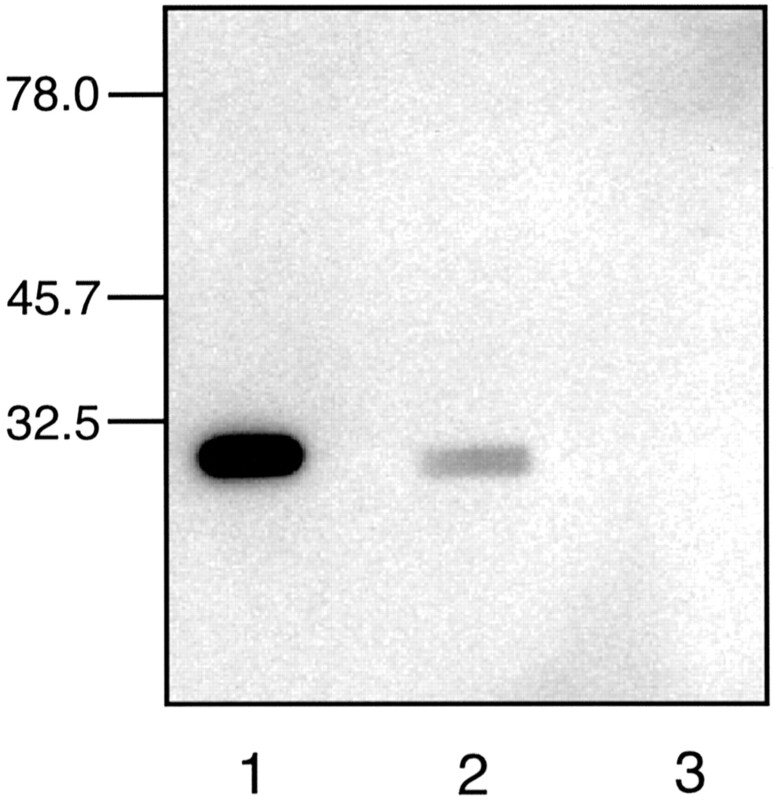 The resulting fragments were analyzed on 3.5% agarose gels (NuSieve, Takara, Japan). In all positive samples, the sizes of the digested fragments were the same as those deduced from the reported sequences (data not shown). RNAs were isolated and reverse transcribed as described above. The relative levels of MBP mRNAs in tissues were determined using TaqMan probes and primers with a model 7700 Prism Sequence Detector (PE Applied Biosystems). The combinations of primers and TaqMan probes specific for mouse S-MBP and L-MBP were determined using the PrimerExpress software package (PE Applied Biosystems). Primers were chosen to lie in different exons to prevent amplification of genomic DNA. The sequences of the primers and probes were as follows: S-MBP sense, 5′-GCTGGCAAATATGGAGGCAG-3′; S-MBP antisense, 5′-CATTGAGAAGGCATGCAACTTG-3′; S-MBP probe, 5′-AGGATCCTGAAATCAAAACTGCAGCTAACCA-3′; L-MBP sense, 5′-GGACAGAGCAGAATTTGATACTAGCG-3′; L-MBP antisense, 5′-ACTCAGAGAGAAGAGCACCCAGTTTC-3′; and L-MBP probe, 5′-TTCAGAAATTGCAGCCCTACGATCAGAGCT-3′. The probes were labeled with FAM at the 5′ end, as a reporter dye, and with TAMRA at the 3′ end, as a quencher dye. Primers and TaqMan probes were purchased from Genset and Applied Biosystems, respectively. Reactions were conducted in a total volume of 50 μl, including 100 nM TaqMan probe, 0.2 μM of each primer, 5.5 mM MgCl2, 200 μM of each dNTP, 0.5 U of uracil-N-glycosylase, and 1.25 U of AmpliTaq Gold DNA polymerase (TaqMan Gold RT-PCR Kit; Applied Biosystems). The conditions used were as follows. The initial step was at 50°C for 2 min and 95°C for 10 min, followed by 40 cycles of a denaturing step for 15 s at 95°C and an annealing-extension step for 1 min at 60°C. For normalization of data, determination of expression of a housekeeping gene, GAPDH, was performed using predeveloped probes and primers (TaqMan rodent GAPDH control reagents; PE Applied Biosystems). Serial dilutions of the cDNA obtained from the liver were used to obtain standard curves. Reactions were performed in triplicate. After obtaining the threshold cycle value for each amplification, data were analyzed according to the relative standard curve method (20). Briefly, the mean relative quantities of MBPs and GAPDH for each sample were obtained by interpolating each threshold cycle value in the corresponding standard curve. S-MBP and L-MBP were then normalized as to GAPDH. Finally, the relative levels of MBP mRNAs in extrahepatic tissues were calculated as percentages of those in the liver. Before dissection of tissues, mice were perfused with 20 mM Tris-HCl and 150 mM NaCl, pH 7.5 (TBS), to wash out the blood and thus prevent the detection of MBPs derived from serum. The tissues were homogenized in TBS (1/10) containing protease inhibitors as follows: 100 μg/ml of PMSF, 2 μg/ml of aprotinin, 40 μg/ml of bestatin, 0.7 μg/ml of pepstatin, 0.5 μg/ml of leupeptin, 40 μg/ml of trypsin inhibitor, 40 μg/ml of phosphoramidon, 100 μM benzamindine, and 1 mM EDTA. The homogenate was clarified by centrifugation at 1,000 × g for 10 min at 4°C to remove debris and nuclei. The resulting supernatant was mixed with an equal volume of TBS containing 1% Triton X-100 and protease inhibitors as described above, followed by incubation for 1 h on ice with gentle stirring. The extract was centrifuged at 105,000 × g for 1 h at 4°C to remove insoluble materials. The resulting supernatant was supplemented with CaCl2 to a final concentration of 10 mM and then applied to an affinity column of mannan-Sepharose 4B prepared as described previously (1). After washing the column with TBS containing 10 mM CaCl2, the bound material was eluted with TBS containing 2 mM EDTA. The eluate was separated by SDS-PAGE on a 12.5% acrylamide gel and then electroblotted onto a polyvinylidene difluoride membrane. After blocking with SuperBlock blocking buffer (Pierce, Rockford, IL) for 2 h at room temperature, the membrane was incubated with 4.5 μg/ml of anti-rat L-MBP polyclonal Abs (rabbit IgG) (21) in SuperBlock blocking buffer overnight at 4°C. The polyclonal Abs raised against rat L-MBP were shown to recognize mouse MBP due to a high sequence homology between rat L-MBP and mouse L-MBP (82%). The anti-rat L-MBP was shown to inhibit the mannan-binding activity of rat L-MBP, but not to inhibit that of rat S-MBP (22). After washing with TBS containing 0.05% Tween 20, the membrane was incubated with biotinylated goat anti-rabbit IgG (Vector Laboratories, Burlingame, CA) for 1 h at room temperature. After washing with TBS containing 0.05% Tween 20, the membrane was incubated with a mixture of avidin DH and biotin-conjugated HRP (Vectastain Elite ABC Reagent; Vector Laboratories). After washing with TBS, immunoreactive bands were visualized with a chemiluminescent substrate kit (SuperSignal West Pico; Pierce) and recorded by a CCD video camera system (LuminoCapture AE-6950; ATTO Bioscience & Technology, Tokyo, Japan). Tissues were dissected from mice that had been perfused with 20 ml of PBS (140 mM NaCl, 2.7 mM KCl, 1.5 mM KH2PO4, and 8.1 mM Na2HPO4) and subsequently with 20 ml of PBS containing 4% paraformaldehyde (PFA). The tissues were immersed in PBS containing 4% PFA overnight at 4°C, followed by immersion in 50 mM phosphate buffer containing 10, 20, and 30% sucrose in a stepwise manner. The tissues were then embedded in OCT compound (Tissue-Tek; Miles, Elkhart, IN) and rapidly frozen on dry ice. Sections were cut (10 or 16 μm) using a CM3000 cryostat (Leica, Wetzlar, Germany) and were then mounted on poly-l-lysine-coated glass slides and stored at −20°C until use. The sections were fixed in PBS containing 4% PFA for 15 min at room temperature and then rinsed with PBS. Endogenous peroxidase activity was quenched by incubating the sections for 30 min with PBS containing 3% H2O2 and 1% Triton X-100. After blocking with SuperBlock blocking buffer (Pierce) for 2 h at room temperature, the sections were incubated with a rat mAb specific for mouse L-MBP (mAb 16A8) (23) diluted with SuperBlock blocking buffer to a concentration of 6.7 μg/ml. After washing with PBS containing 0.05% Tween 20 (PBS-Tween), the sections were incubated with biotinylated anti-rat IgG polyclonal Abs (Vector Laboratories), which had been diluted with SuperBlock blocking buffer to a concentration of 5 μg/ml, for 40 min at room temperature. After washing with PBS-Tween, the sections were incubated with the mixture of biotin and avidin DH (Vectastain Elite kit; Vector Laboratories) for 40 min at room temperature. After washing with PBS-Tween and PBS, immunoreactivity was visualized with a 3-amino-9-ethyl-carbazole substrate kit (Vector Laboratories). The sections were then counterstained with Mayer’s hematoxylin. The 452-bp fragment corresponding to nt 307–758 of mouse S-MBP cDNA and the 676-bp fragment corresponding to nt 147–772 of mouse L-MBP cDNA were amplified by RT-PCR from total liver RNA and then inserted into the pCR 2.1 plasmid vector (Invitrogen, San Diego, CA) in both sense and antisense directions. The resulting plasmids containing the S-MBP or L-MBP fragment were linearized by HindIII or BamHI digestion, respectively. 35S-labeled RNA probes were synthesized in a total volume of 20 μl RNA polymerase buffer (40 mM Tris-HCl (pH 7.5), 6 mM MgCl2, 5 mM NaCl, and 2 mM spermidine) containing 4 mM DTT; 100 μg/ml BSA; 0.5 mM each of ATP, GTP, and CTP; 30 U of ribonuclease inhibitor; 1 μg of linearized template DNA; 10 U of T7 RNA polymerase (Nippon Gene, Toyama, Japan); and [α-35S]UTP (Amersham Pharmacia Biotech, Amersham, U.K.) for 1 h at 37°C. After treatment with DNase I, the RNA probes were purified by phenol-chloroform extraction and ethanol precipitation. Frozen sections (10 or 16 μm) of mouse tissues were mounted on glass slides with positively charged surfaces (MAS-coated slides; Matsunami Glass, Kishiwada, Japan) and stored at −80°C until use. The sections were fixed in PBS containing 4% formaldehyde for 30 min at room temperature, rinsed in PBS, and then treated with 5 μg/ml of proteinase K in 20 mM Tris-HCl and 2 mM CaCl2 (pH 7.4) for 5 min at 37°C. After rinsing in PBS, the sections were immersed in 0.25% acetic anhydride in 0.1 M triethanolamine/0.9% NaCl for 10 min and then dehydrated through an ethanol series (70, 85, 95, and 100%). The sections were prehybridized for 1 h at 55°C in 5× SSC containing 50% formamide, 5× Denhardt’s solution, 10 mM EDTA, 20 mM DTT, and 0.25 mg/ml of yeast tRNA, followed by hybridization with 35S-labeled RNA probes for 18 h at 55°C in 5× SSC containing 50% formamide, 2.7× Denhardt’s solution, 10 mM EDTA, 20 mM DTT, 0.25 mg/ml tRNA, 10% dextran sulfate, and 0.02% heat-denatured salmon sperm DNA. Thereafter, the sections were rinsed three times in 2× SSC containing 10 mM DTT, and then treated with 50 μg/ml of RNase A in 10 mM Tris-HCl, 0.5 M NaCl, and 1 mM EDTA, pH 8.0, for 30 min at 37°C, washed twice at 55°C for 30 min each time in 2× SSC containing 50% formamide and 10 mM DTT, and rinsed once at 55°C for 30 min in 2× SSC. The washed sections were dehydrated in an ethanol series and then air-dried. The sections were dipped in a liquid emulsion (NTB3; Eastman Kodak, Rochester, NY) diluted 2-fold with water, exposed for 4 wk, and developed. Counterstaining was performed with hematoxylin only or H&E. The previous study by Sastry et al. (3) showed that the mRNAs of mouse S-MBP and L-MBP are expressed only in the liver, as determined with Northern blotting using total RNA from a limited number of tissues. To explore the extrahepatic expression of mouse MBP, we investigated the tissue distribution of mouse MBP mRNAs by RT-PCR with specific primers using total RNA obtained from 19 different mouse tissues. A fragment of 452 bp corresponding to the carboxyl-terminal portion of the collagen-like domain, the neck domain, and the major portion of the carbohydrate recognition domain of S-MBP was amplified for the detection of S-MBP mRNA, and a fragment of 262 bp corresponding to the carboxyl-terminal portion of the collagen-like domain and the neck domain of L-MBP was amplified for the detection of L-MBP mRNA. As shown in Fig. 1⇓, S-MBP mRNA was found in lung, kidney, and testis as well as in liver, whereas L-MBP mRNA was found in kidney, thymus, and small intestine as well as in liver. All PCR products were checked by digestion with restriction enzymes, because it was found that the lengths of the digested fragments were identical with those deduced from the reported sequence for S-MBP or L-MBP (3) (data not shown). Expression of L-MBP and S-MBP mRNAs in mouse tissues. Total RNA obtained from various tissues of C57BL6 mice was subjected to RT-PCR using primers specific for L-MBP, S-MBP, or β-actin. All PCR reactions were performed for 35 cycles. The PCR products were electrophoresed on 2% agarose gels and stained with ethidium bromide. Although only gel regions containing specific products are shown, nonspecific bands were absent in all gel regions. To quantify the levels of extrahepatic expression of MBPs mRNA revealed above, we employed a quantitative real time RT-PCR method (TaqMan RT-PCR), as described in Materials and Methods. As shown in Table I⇓, the relative levels of expression of S-MBP mRNA in the lung, kidney, and testis were ∼1.0, 0.52, and 0.23%, respectively, compared with that in the liver. On the other hand, marked extrahepatic expression of L-MBP mRNA was observed in the small intestine, in which the relative level of expression of L-MBP mRNA was ∼8.7% that in the liver. The relative levels of expression of L-MBP mRNA in kidney and thymus were ∼0.06 and 0.02% compared with that in the liver, respectively. These results indicate that the extrahepatic expression of mouse MBP is most pronounced in small intestine. We next examined whether L-MBP protein is synthesized in small intestine, which was revealed to be a major site of extrahepatic expression of MBP at the transcriptional level. To do this, an extract of small intestine was enriched with MBP using a mannan-Sepharose 4B column and was then analyzed by Western blotting with anti-rat L-MBP polyclonal Abs. To prevent the detection of L-MBP in serum (23, 24), the mice had undergone systemic perfusion with a large volume of TBS before removal of the tissues. As shown in Fig. 2⇓, a 29-kDa band corresponding to L-MBP was detected for the extract of the small intestine as well as for that of the liver. On the other hand, no specific bands were detected in brain extracts. This agrees with the results of the RT-PCR and indicates the efficacy of the systemic perfusion with buffer for washing out the plasma proteins, and thus also the liver-derived L-MBP, before removing the organs. These results indicated that the L-MBP mRNA in the intestine detected in the RT-PCR analysis was, in fact, translated into a protein with mannan-binding activity and with the same molecular size as that of L-MBP in liver. Expression of L-MBP protein in mouse small intestine. L-MBP was extracted from mouse tissues, enriched by affinity chromatography on mannan-Sepharose 4B, and then subjected to SDS-PAGE under reducing conditions on a 12.5% gel. Western blotting was performed using polyclonal Abs against L-MBP. Detection of L-MBP existing in serum was prevented by systemic perfusion before dissection of tissues. Lane 1, Liver; lane 2, small intestine; lane 3, brain. Molecular mass markers, expressed in kilodaltons, are indicated in the left margin. To reveal the location of the L-MBP-producing site, we conducted immunohistochemical staining using mAb 16A8 specific for mouse L-MBP (22) on PFA-fixed cryosections of various gastrointestinal tissues obtained from mice that had undergone systemic perfusion. As shown in Fig. 3⇓, strong staining was observed in some villous epithelial cells throughout the small intestine, whereas the other parts of the small intestine, including crypts, Peyer’s patches, and lamina propria, were not stained (Fig. 3⇓, b–d). Goblet cells were also negative. Villous epithelial cells strongly stained with mAb 16A8 were found to occur much more frequently in the jejunum (47%) than in duodenum (20%) or ileum (14%). Obvious staining was not observed in either stomach or colon (Fig. 3⇓, a and e); this was consistent with the results of RT-PCR shown in Fig. 1⇑. No staining was observed in controls using normal rat IgG (data not shown). These results indicate that mouse intestinal L-MBP is exclusively expressed in some villous epithelial cells. Immunohistochemical localization of L-MBP in mouse gastrointestinal tissues. PFA-fixed cryosections of mouse gastrointestinal tissues were stained by means of an avidin-biotin complex technique using mAb16A8 specific for mouse L-MBP and were counterstained with hematoxylin. 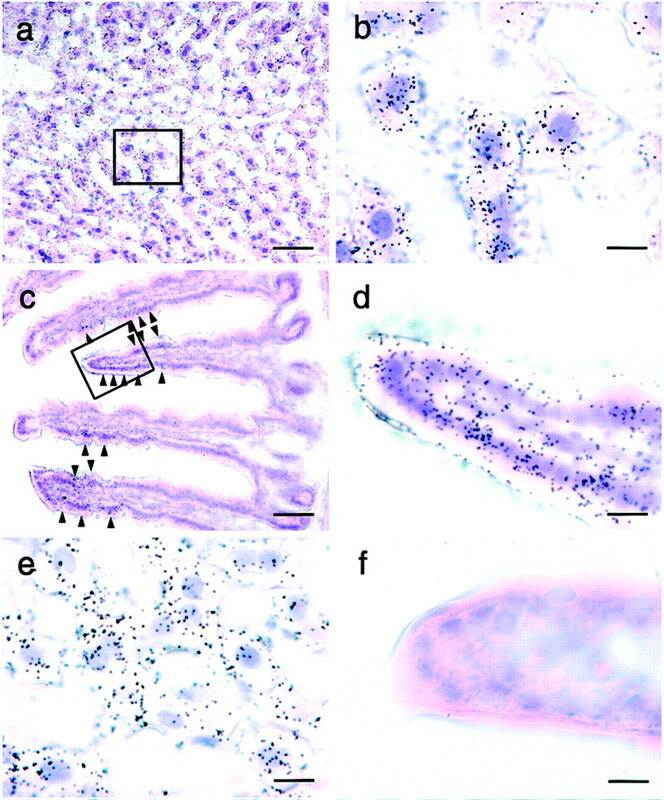 a, Stomach; b, duodenum; c, jejunum; d, ileum; e, colon; f, higher magnification view of the positively stained jejunal epithelium indicated by a box in c. Bars in a–e and f = 100 and 25 μm, respectively. The localization of MBP mRNAs in small intestine as well as liver was confirmed by in situ hybridization using 35S-labeled RNA probes specific for L-MBP and S-MBP. The expression of L-MBP mRNA was found in some intestinal epithelial cells as well as in nearly all hepatocytes (Fig. 4⇓, a and c). On the other hand, the expression of S-MBP mRNA was not detected in small intestine, although it was found in nearly all hepatocytes (Fig. 4⇓, e and f). Control hybridization with sense strand RNA probes for L-MBP and S-MBP showed only background levels of silver grains, confirming the specificity of the signals (data not shown). These results are consistent with the results of RT-PCR and immunohistochemistry, as described above, suggesting that intestinal L-MBP expression is mainly regulated at the transcriptional level. The densities of silver grains in some L-MBP-positive cells were comparable to those in the hepatocytes (Fig. 4⇓, b and d), suggesting that the expression of L-MBP mRNA in some intestinal villous epithelial cells is as high as that in hepatocytes at the cellular level. In situ hybridization of mouse MBP mRNAs. In situ hybridization was performed using 35S-labeled antisense strand RNA probes specific for L-MBP (a–d) and S-MBP (e and f) on sections of mouse liver (a, b, and e) and small intestine (jejunum; c, d, and f) as described in Materials and Methods. The sections were counterstained with H&E (a–d and f) or with hematoxylin only (e). b and d, Higher magnification views of the liver and intestinal villi indicated by boxes in a and c, respectively. Arrowheads in c indicate representative positive cells, in which clusters of silver grains can be seen. Bars = 100 μm (a and c) or 20 μm (b, d, e, and f). It has been well established that liver is the major site of synthesis of both S-MBP and L-MBP (3, 25, 26). Early reports demonstrated mannan or mannose-BSA binding proteins with molecular masses of ∼30 kDa in rat mesenteric lymph node or mouse spleen, respectively (27, 28), and a more recent study involving RT-PCR and in situ hybridization demonstrated the expression of rat S-MBP mRNA in renal capsules and distal convolutions (18). In the present study we examined the tissue expression of mouse MBPs in 19 tissues, including liver, by RT-PCR. The extrahepatic expression of S-MBP mRNA was demonstrated in lung, kidney, and testis, whereas that of L-MBP mRNA was demonstrated in kidney, thymus, and small intestine (Fig. 1⇑). On measurement by quantitative real-time RT-PCR, the small intestine was obviously distinguishable from the other tissues by the expression of L-MBP mRNA at a level of 8.5% to that in liver, while the expression of L-MBP in kidney and thymus was <0.1% of that in liver. The extrahepatic expression of S-MBP was approximately or <1% of that in liver. (Table I⇑). This suggests that L-MBP may have some biological significance in the small intestine. The biological function of L-MBP is a bit controversial compared with the well-documented function of S-MBP in innate immunity. The rat L-MBP was located in the lumen of the endoplasmic reticulum and the Golgi apparatus in hepatocytes, and it was shown to bind to biosynthetic intermediates of various glycoproteins with high mannose-type glycans (29, 30). Based on these findings, it was suggested that L-MBP might be involved in the intracellular trafficking of biosynthetic intermediates of glycoproteins. On the other hand, mouse L-MBP has been detected in sera at higher concentrations than S-MBP and was also demonstrated to activate complement, although the activity is 5- to 10-fold weaker than that of S-MBP (23). These findings suggest that L-MBP may, like S-MBP, be involved in innate immunity. It should be noted here, however, that these two possible functions are not virtually exclusive. L-MBP may have different functions depending upon the location of the lectin. Western blotting of tissue extracts using anti-L-MBP polyclonal Abs revealed that the small intestine expressed L-MBP protein of the same size as that in liver under reducing conditions. These results and the fact that L-MBP in the tissue extracts had been enriched by affinity chromatography on a mannan-Sepharose 4B column suggest that the L-MBP protein synthesized in small intestine is structurally and functionally equivalent to that in liver. Immunohistchemical staining and in situ hybridization of the small intestine revealed that L-MBP is selectively expressed in some intestinal villous epithelial cells. Within those cells, strong immunoreactivity to mAb16A8 was preferentially found in the apical part of the cells (Fig. 3⇑f). The villous localization of mouse L-MBP in gastrointestinal tissues is similar to that of rat surfactant protein A (31) and human surfactant protein D (32), both of which are members of the collectin (collagen-like lectin) family involved in regional innate immunity. Many other humoral innate immune factors, for instance, antimicrobacterial defensins, lysozyme, and phospholipase A2, are preferentially expressed in the secreting granules of intestinal Paneth cells at the bottom of crypts (33), where little or no L-MBP was detected in the present study. It is interesting to note this distinct compartmentalization between MBP and the other bactericidal proteins in intestinal epithelium. Although the primary roles of villous epithelial cells are the absorption of nutrients and presenting a physical barrier against invasion by microorganisms, villous epithelial cells are known to play an active role in immunity; for example, transportation of secretory IgA into the lumen from the lamina propria (34), production of cytokines and chemokines in response to bacterial invasion (35), and Ag presentation via various MHC molecules, including class II and nonclassical class I molecules (36). Thus, it may be reasonable to speculate that L-MBP secreted from villous epithelial cells acts as a humoral immune factor in the intestine, just as does secretory IgA. In addition to the localization of intestinal L-MBP along the crypt-villus axis, a unique localization along the proximal-distal axis was also found in this study. The villous epithelial cells that express L-MBP were most abundantly distributed in the jejunum, less abundantly in duodenum and ileum, and not at all in colon and stomach. It is well known that a large number of bacteria reside in colonic contents (∼1011 organisms/ml), and that the number of bacteria resident in small intestine decreases markedly (105-106 organisms/ml in distal ileum and 102 organisms/ml in jejunum and duodenum) (37). It is likely that mucosal factors are responsible for maintaining the relative sterility of jejunum despite the abundance of nutrients and neutral pH. 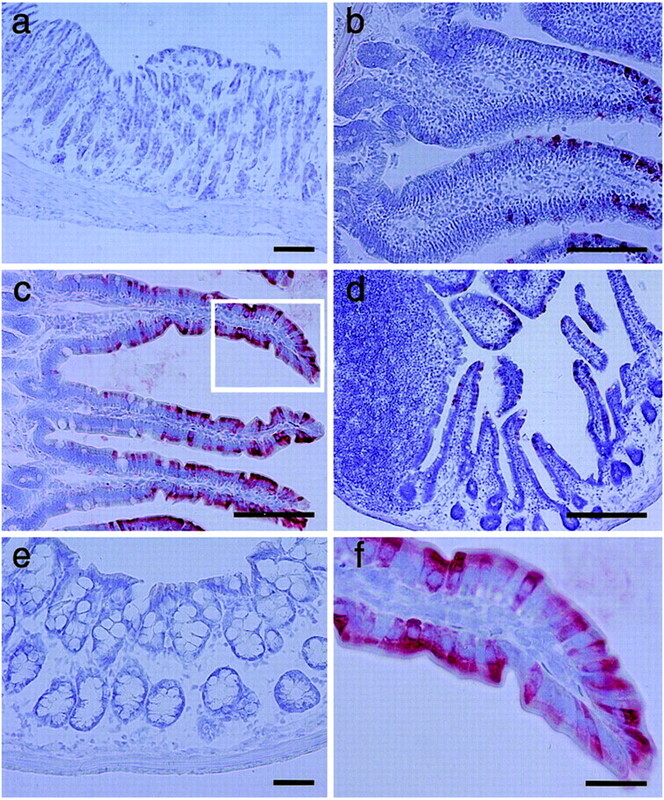 The maximal expression of intestinal L-MBP in jejunum may contribute to the relative sterility of the jejunum. The mechanisms of the host defense mediated by L-MBP in the small intestine remain to be studied. However, L-MBP may act as a defense factor by simply masking the surface of microorganisms, enhancing phagocytosis (14), or inhibiting the attachment of microorganisms on intestinal cell surfaces. Human MBP deficiency has been associated with recurrent infections, including persistent diarrhea (16). The etiology of diarrhea in patients with MBP deficiency is not fully understood. It has been reported that MBP was found in duodenal fluid (38). In that report it was suggested that serum MBP might be trans-exudated into the intestinal lumen due to abnormal permeability of infected mucosa. Our current findings may provide an explanation for the causal relationship between MBP deficiency and diarrhea. In summary, we have examined the expression of mouse MBPs and found a relatively abundant expression of L-MBP in small intestine. The expression of L-MBP was found to be restricted to villous epithelial cells. We thank Tomoko Honda for her secretarial assistance, and Drs. Mitsutaka Sawada and Tsutomu Chiba (Department of Gastroenterology and Hepatology, Graduate School of Medicine, Kyoto University, Kyoto, Japan) for their kind advice and helpful discussion. ↵1 This work was supported in part by Grants-in-Aid for Scientific Research on Priority Areas (C-13214053 and C-13226045, to T.K.) and a Grant-in-Aid for Encouragement of Young Scientists (A-12780471, to K.U.) from the Japan Society for the Promotion of Science, Ministry of Education, Culture, Sports, Science, and Technology of Japan. ↵2 K.U. and M.S. share first authorship (these authors contributed equally to this work). ↵4 Abbreviations used in this paper: MBP, mannan-binding protein; L-MBP, liver-type MBP; MBL, mannan-binding lectin; PFA, paraformaldehyde; S-MBP, serum-type MBP. PE AppliedBiosystems. 1997. ABI Prism 7700 Sequence Detection System User Bulletin No. 2 (company newsletter). Mostov, K., C. S. Kaetzel. 1999. Immunoglobulin transport and the polymeric immunoglobulin receptor. P. L. Ogra, and J. Mestecky, and M. E. Lamm, and W. Strober, and J. Bienenstock, and J. R. McGhee, eds. Mucosal Immunology 133 Academic Press, San Diego. Wilson, K. H.. 1991. The gastrointestinal microflora. T. Yamada, and D. H. Alpers, and C. Owyang, and D. W. Powell, and F. E. Siverstein, eds. In Textbook of Gastroenterology Vol. 2: 532 Lippincott, Philadelphia.